The following section describes the main areas of the Label Creator window. Use the Add Object area to add images, shapes such as rectangles, circles, and lines, text, or a picture index to your project. The Edit Layout area lets you change the appearance of the layout. In the Edit Layout area you can select a Style for your project, show and hide Smart Objects, or change the background of your project. A layout is the design for your label, insert, booklet, or cover. The Layout area is where you work on the content and appearance of your project. For more information, see Selecting layouts. 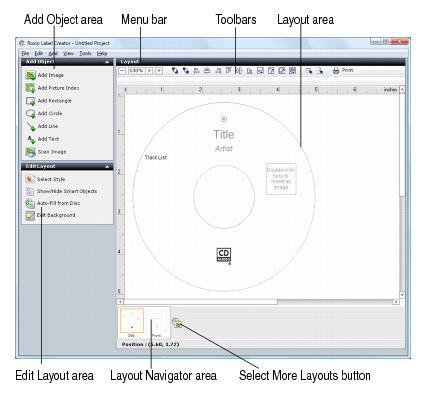 The Toolbars provide the tools to work with objects on your layout. The top row buttons are always available, for example, the zoom, print, and alignment buttons. The bottom row buttons change depending on the type of object selected in the Layout area. For example, if you have selected a text object, the tools are text object property tools, such as font and font color. The Layout Navigator displays thumbnails of the layouts in the current project. You can only work on one layout at a time in the Layout area, but thumbnails of the other layouts are displayed in the Layout Navigator. To work on another layout, click its thumbnail in the Layout Navigator. You can also add layouts to your project by clicking the Select more layouts button beside the layout thumbnails.